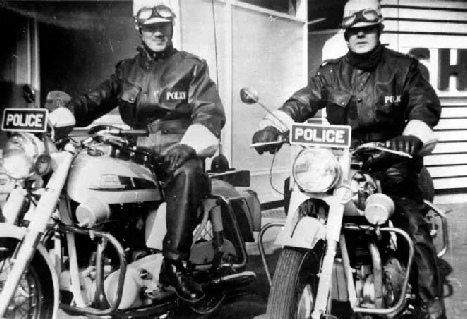 In response to requests from USA dealers for a machine that could accelerate from 10 mph to 100 mph in top gear and have an engine capacity neared to the home grown product, Norton took the 650 cc Dominator, upped its engine capacity to 745 cc, lowered the compression ratio and called it the Atlas. From March 1962 and equipped with high rise bars, it was export only to the USA. 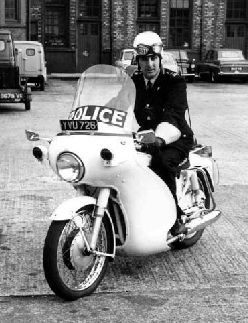 From September 1963 it was available in the Police version, but the public in the UK had to wait until February 1964 to buy one. The 750 Atlas engine differs externally from the 650 Dominator by having the crankcase breather on the front left and by having taller but thinner holding-down nuts on the barrel to crankcase studs. The same engine was then used in the Matchless G15 and AJS Model 33, and was the basis for the Commando. The last one built was in 1969, the same year that the prototype Interpol was shown. Capacity 745 cc. 73 mm bore x 89 mm stroke. Compression ratio 7.6:1. Gearbox- 4-speed AMC, top 4.53. Rear chain 5/8” x 1/4”, then 5/8” x 3/8” 1966 on. Power - 49 BHP* @ 6800 rpm = 117 MPH. * Bracebride St. Factory raised this to 59 BHP. Electrics - Alternator, Rectifier, 6 volt, Positive Earth. From 1966 12volt with Zener Diode used. Ignition - Magneto for 1962 to 1967 models, Capacitor Ignition for 1968 to 1969 end. Carburettors - For 1962 & 1963 - Single Amal Monoblock 376. For 1964 to 1966 - Twin 376’s were used. From the middle of 1967, twin Concentric 930’s were used with Coil Ignition and Capacitor. Tank Capacity (civilian) 3.6 gallons. (Police) Approx 0.5 less with radio recess. Wheels & Tyres - Front WM2 3.00”x 19”. Rear WM3 4.00”x 18”. Weight, dry, civilian spec, 410 Lbs. Note - Norton used /P on engines to indicate that it was made in the Plumpstead, London, factory. It does not indicate a Police build. A suffix of ‘P’ on earlier machines is a date code of 1959 and ‘R’ is 1960 etc.